Translations have always fascinated me and even more so when I read this quote by Miguel de Cervantes: ‘Translations are the other side of a tapestry.’ That set me thinking. You have the original writer writing in their own language. Then you have the translator writing in theirs and, in some cases, you have translations from translations, not to mention literal translations. Most early English translations of Turgenev were not from Russian, but from French! In 1994 Donald Rayfield compared Garnett's translations with the most recent scholarly versions of Chekhov’s stories: ‘While she makes elementary blunders, her care in unravelling difficult syntactical knots and her research on the right terms for Chekhov's many plants, birds and fish are impressive . . . Her English is not only nearly contemporaneous to Chekhov's, it is often comparable.’ In the 1998 anthology, The Essential Tales of Chekhov, the Constance Garnett translations were used by its editor, Richard Ford. 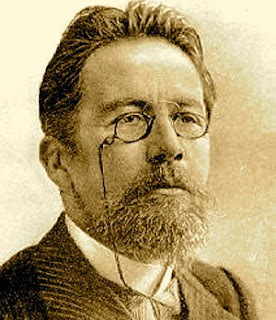 On the basis of the story title and the opening sentence alone, which ‘other side of a tapestry’ would you choose as the most authentic ‘voice’ of Chekhov? Which has the most nuance and style? Having read all the various versions of this story, I know who my money would be on.